Alpha Store is free WooCommerce theme for WordPress. This eCommerce shop theme is suitable for mobile, furniture, home appliances, kitchen, electronics, art gallery, medical, tools, fashion designer clothes, food, jewellery, beauty store, watches and Multipurpose stores. 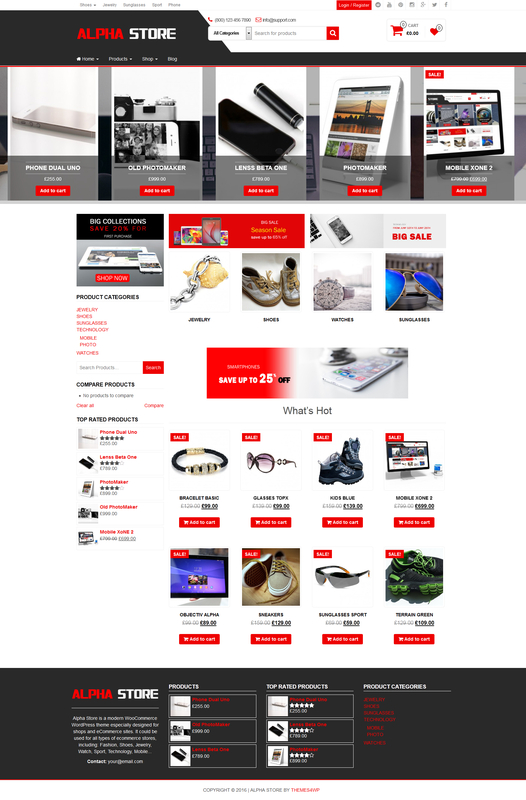 The theme is ideal for any kind of shopping store from clothes to electronics stores. The theme includes all needed ecommerce features for building of a powerful online store such as powerful theme options panel, popular WooCommerce plugins support, unlimited product blocks and much more… Alpha is Store fully customizable and suitable for any kind of eCommerce store on any device. It requires no specialized knowledge or preparation, given that the layout is highly intuitive. This WooCommerce theme is responsive which mean that you can get the best out of it on mobile, tablets, and desktop. The design is well suited for Electronics Store, fashion store, clothing store & much more. Alpha Store is not only about a beautiful design, but also about a fully functional theme that focus on user experience and usability. Start your Store right away with Alpha Store WooCommerce theme. Alpha Storeis a light, beautiful and responsive WordPress eCommerce theme that can easily turn your WordPress site into a professional online store. Theme support popular WooCommerce plugins as wishlist, product compare and quick view. Built with Bootstrap and CSS3 this creative theme is fully responsive design ready for the perfect look on any device. Theme is fully translation ready. Alpha Store is very fast WooCommerce theme for WordPress. Go to widgets – Footer Section and put the widgets there.